Tourism Fiji says that holidays in Fiji are the tourists experience of a lifetime and their chance to escape to a world without stress......But there is a lot of stress abound in Fiji that tourists don't hear about or deliberately ignore. The reality is that right next door to their wonderful holiday accommodation are the people of Fiji living under an oppressive, brutal and corrupt dictatorship. 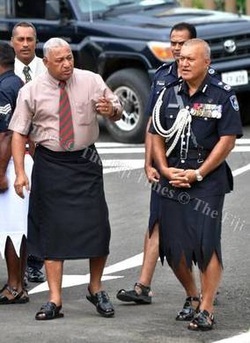 Where the Fiji police are led by COMPOL Brigadier General Ioane Naivalurua (a Sandhurst golden baton recipient, and a bloody corrupt officer) and a 4th form high school drop-out dictator Josaia Voreqe Bainimarama, who order and support the beatings and torture of citizens. Unfortunately, both the foreign ministers of Australia (Bob Carr) and New Zealand (Murray McCully) were informed about these types of beatings and torture way back in 2011 but they deliberately chose to ignore it. The highly promiscuous PS information in Fiji, Sharon Smith-John, an Australian, also continually states publicly that there is no torture in Fiji. Now here is visual proof of the brutal torture conducted by Fiji's police and military on two citizens. Police Commissioner Brigadier General Ioane Naivalurua this evening said every one in Fiji was “disturbed to see the video that has emerged of what appears to be the abuse of two men who, at this stage, we understand to be recaptured prisoners.” But he condoned and approved it.